This Raj jat yatra originates from the Nauti village 20 km of Karnaprayag tehsil of Indian state of Uttarakhand. The Kunwar of village Kansua inaugurates the ceremony. The legend is this that Nanda Devi, consort of Lord Shiva left her village and went to the nanda devi parbat. Therefore when the yatra starts, heavy rain occurs as if the devi is crying. This yatra covers many villages and in between the Devi meets her sister in the Bhagwati village. This yatra is very tough on account the landscape it goes through. In between the yatra there comes a Lake Roopkund where lies the hundreds of skeletons. It is said that once the King took some dancers to this sacred place due to which heavy snow fell and people died and the dancers got transformed into stone which can be sen in Patarnachonia. The other myth is this that king Yasodhwal's wife was pregnant and while she was giving birth to her child, her placenta flowed down to Roopkund and this in turn caused the death of the people on that place. That is why the river Nandakini lost her significance and the Nandprayag is not considered sacred as the other Panch Prayags like Devprayag and Rudraprayag. In some areas, there is a tradition of organizing annual Jat as Well. These Jats are slightly different and cover a smaller circuit. Such annual Jats are common in Garhwal-Kumaon areas. At many places. Firs are held and special worship is performed in Nanda temples. 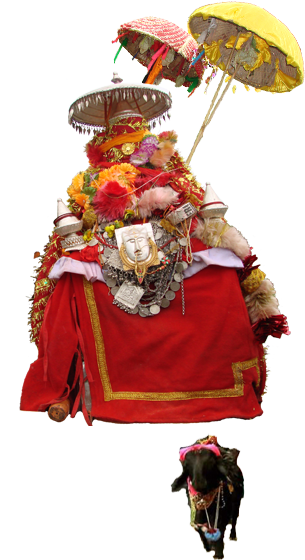 Places associated with such celebrations include Danpur, Katyur, Vadhan, Nainital, Almora, Johan, Kurur and Devrada. At Kurur and Devrada. At Kurur, the celebrations continue for several days and Jat is taken upto Vaidnikund. Parvati (Shail Putri),the daughter of Hills and the consort of Lord Shiva,is known as Nanda in Garhwal & Kumaon areas. The Popularity of the Goddess is understandable , as the highest peak of the distct has been identified with the name of the deity,also several Nanda temples are situated at all the prominent places in Garhwal and Kumaon like Nauti,Chandpur,Kurur,Devrada,Kulsari,Nandkesri,Lohajang,Shila Samudra,Nandakot Vaidini,Srinagar,Sink,Devikhet,Nandprayag,Gopeshwar,Helang,Lata Niti and Badrinath.Similarly the Kumaon region include Nanda Devi temples located at Nainital,almora,Baijnath,Shuwbhgash,Munsiyari,Doonagiri,Jageshwar,Bageshwar and Ranikhet.